Exciting news! 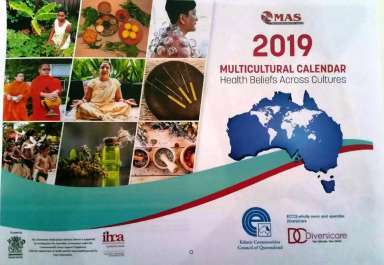 Diversicare’s Multicultural Advisory Service (MAS) has finalised the 2019 Multicultural calendar. Watch out for the printed copy of the Multicultural Calendar in your region. Talk to your local MAS Officers who will be delivering the calendar around early December. This year’s calendar features 12 articles which offer a glimpse into health beliefs from around the world, and it provides an opportunity to celebrate significant dates with staff and consumers.